There is nothing exciting to report from the September 5 hearing beyond what we noted below, though additional dates have been scheduled for the Mandatory Settlement Conference ordered by Judge Gilbert Ochoa in San Bernardino County, California. The miners and their attorneys are continuing to go through the 2012 regulations point-by-point. Judge Ochoa has ordered the involved parties to return to his court for additional hearings September 16 - 17, and has also set aside September 30 - October 2, 2014 as additional hearing dates as needed. The suction gold dredge settlement hearings reconvened on September 4, 2014, in front of Judge Gilbert Ochoa in San Bernardino County. First, let's revisit the previous hearings, which concluded on July 25. Judge Ochoa continued the hearing until September 4, 2014. He ordered the involved parties to go through the new dredging regulations established in 2012 and address each point individually, then present their negotiating points to the court. Ron Kliewer, one of our senior writers, is a plaintiff in this case and was present as the hearings reconvened on September 4. If the legal system functions as intended, upholding the rule of law, the dredgers may very well be back in the water by next summer. We can only pray that those in authority uphold the rule of law as it was intended. Today was day one of Chapter Two in the Mandatory Settlement Conference. By definition, the very title that uses the word “settlement” implies that neither party will get the whole pizza. By working through all the issues and coming to a working agreement, both sides in these cases should be able to walk away with what they feel is a workable settlement. As one of the plaintiffs, I can’t say anything detailed about the internal process that is taking place, but I can say that I believe there is some golden glimmer showing that we are making progress. 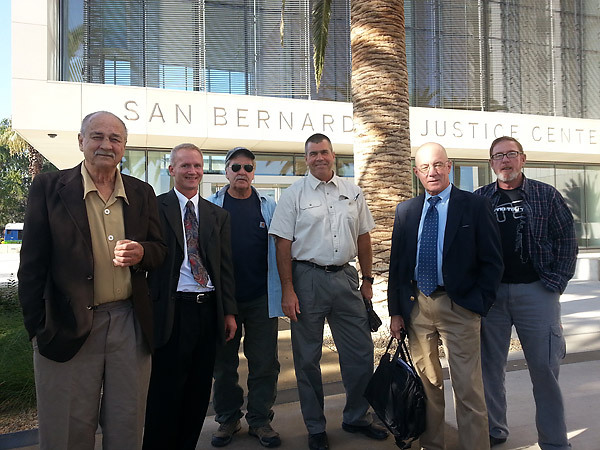 It is slow, hard work, and costs a lot of time and money on the part of the plaintiffs -- a handful your fellow dredgers traveling from around the country to San Bernardino to fight the good fight -- but we are starting to gain momentum in the mining communities’ favor. It is also expensive to keep our team in the fight with all the legal expense, but we are playing the hand we were dealt and making lemonade out of lemons. Dave McCracken commented at the end of today’s court work that he feels we made more progress today than we have in two years of litigation. I am cautiously optimistic. Time will tell. Thanks to you all who have donated to Public Lands for the People -- you are as much in the fight as those of us that are in the courtroom. Without your donations, we wouldn’t have made it this far! Thomas Paine, Ben Franklin, George Washington and the rest of the Founders aren’t here for this fight. It’s our turn to pick up the torch and fight. Let’s finish strong; we are modern day patriots, upholding freedom and the rule of law that was so generously given to us by our forefathers. -- The hearings continued today, September 5, and we will continue to keep you posted. In the meantime, Public Lands for the People continues to raise funds to pay the attorneys involved in this case. Please visit the Public Lands for the People eBay pages to purchase gold or other items offered for sale, or visit their website to become a member or renew your membership.